It is no longer possible to find the X552EA laptops from ASUS but they continue to make X series laptops with more up to date versions of the AMD processor. For more current options of affordable laptops, read reviews of the best laptops under $500 andthe best ASUS laptops to buy now. For those looking for an extremely low-cost laptop, the ASUS X552EA-DH41 is probably one of the most affordable out there. The performance is going to be below what many of the Intel-based systems have to offer but it is still sufficient for those that need just a basic laptop. Of course, with its low cost comes some significant limitations. For instance, the memory while it can be upgraded is actually quite expensive due to the single slot limitation. In addition, the keyboard is passable but the trackpad has some major sensitivity issues that make it very difficult especially with Windows 8's multitouch gestures. Of course, if you have a budget of just $400, it might be hard to find something equivalent to this. 15" x 10" x 1.3" @ 5.1 lbs. 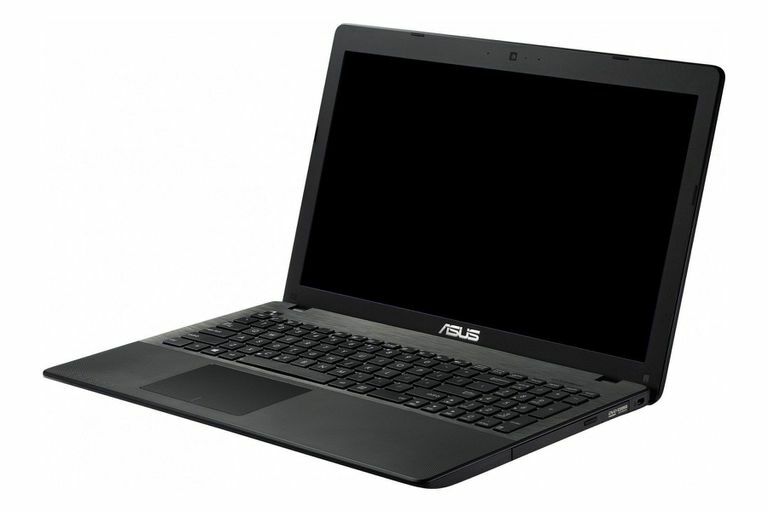 The ASUS X552EA laptop pretty much does not deviate from the previous ASUS X550 laptop that preceded it. Most of the differences are internal rather than external. The laptop is generally found in the all-black color configuration although some models will feature some silver toned keyboard decks or display lids. The surfaces are textured to help reduce fingerprints and smudges. While not as thin as some newer laptops, it isn't unreasonable at 1.3-inches at the hinge and the weight is a fairly typical 5.2 pounds. Rather than using Intel for the X552EA-DH41, ASUS has elected to use the AMD A4-5000 processor. This is an interesting choice as it does offer four processor cores but runs at a very modest 1.5GHz clock speed. In terms of performance, this puts it close to the Intel Pentium 2117U dual-core processor so this is not going to be a powerhouse chip even with its four cores. For those looking at a basic system for browsing the web, watching media and productivity applications, it will work just fine. Try to get into more demanding applications like graphics work and you will notice its limitations. The processor is matched up with 4GB of DDR3 memory to keep the price low. It runs smoothly enough with Windows 8 but can get bogged down with lots of applications open. The memory can be upgraded but there is only a single memory slot which makes it expensive to replace the 4GB modules with an 8GB one. Buyers might consider the X552EA-DH42 which is essentially the same laptop but with 8GB. Storage for the ASUS X552EA-DH41 is common of what you see in many budget laptops. It relies on a 500GB hard drive that spins at a 5400rpm. This means that performance is not the best especially compared to more expensive systems that use faster and larger hard drives or solid state drives but its pretty much to be expected in this price range. One nice thing that ASUS did was include two USB 3.0 ports on the left-hand side for use with high speed external hard drives for easy storage expansion. The only downside is that there are only 2 USB ports, which is less than your average 15-inch laptop. There is a dual layer DVD burner included for playback and recording of CD or DVD media. There isn't much to say about the display or graphics for the ASUS X552EA-DH41. It uses a standard TN technology 15.6-inch display panel with a native resolution of 1366x768. This makes it like most other budget systems by providing just enough resolution, brightness, and color. It is not a touchscreen which is becoming a bit more common at the lower price points but the decision to not have this is to keep the costs really down. While they have been fine in the past, consumer expectations are getting higher as many low-cost tablets are featuring better screens. As for the graphics, they are powered by the Radeon HD 8330 that is built into the A4-5000 processor. While this may sound like it would perform fairly well, it actually is a very low-end graphics capabilities. In fact, in many instances, it fared pretty much the same as the Intel HD Graphics 2500 when it comes to 3D performance or even accelerating non-3D applications. Do don't look to this for much beyond just watching media and running standard windows applications. ASUS is generally fairly well regarded when it comes to their keyboards and the X552EA looks like it should be pretty good. It uses the standard ASUS design of an isolated layout and even has some large keys for shift, enter, tab and backspace. The problem is that the keyboard offers a bit too much flex compared to some of their other models which means that it doesn't have the same level of feel. It is still a decent keyboard, just not as nice as some of their more expensive laptops. The trackpad is a nice size that is centered upon the keyboard layout rather than the laptop. It features integrated buttons which work well enough. It does support multitouch gestures in Windows 8 but they can be difficult to use at times as the pad seems overly sensitive at the default settings. The battery pack for the ASUS X552EA uses a somewhat smaller 4 cell, 37WHr capacity pack which is smaller than your typical 15-inch laptop. Since the processor is designed to be a bit more power efficient it does not seem to impact the battery life much. In digital video playback testing, the system lasted for just under four hours before going into standby mode. This puts it pretty much in the average zone for a laptop of this size and price range. The only downside is that the performance of the processor is a bit less than some of the competing laptops. Pricing for the ASUS X552EA-DH41 is probably one of its biggest advantages. The system features a list price of roughly $400 but it can often be found for less than that. This makes it one of the most affordable complete laptops at this price point but it is a bit more plain in the features. In fact, most of the competition is priced closer to $500. Both the MSI S12T 3M-006US and the Toshiba Satellite C55Dt-A5148 use the same AMD processor with 4GB of memory for similar performance. The MSI opts for a smaller form factor with just an 11.6-inch touchscreen display while the Toshiba uses a 15.6-inch touchscreen display. In addition to the touchscreen, they both also offer 750GB hard drives for more storage space. Both only have a single USB 3.0 port and the MSI does not have a DVD drive.